So here's the deal: To be fair, Rich has done some of it. Maybe even 5% or so! Seriously, though, I found out about this system, Site Build It, through a friend. It's so much to explain, but here goes. Site Build It, or SBI, is a total package (full disclosure: it cost me $299) that walks you (well, walked me) through the entire process of starting a web business. Rich approached it with some skepticism, since he knew the business already, and it seemed to be offering so much in one package. What's the catch, right? Well, after some research, it passed the scrutiny, and we decided to give it a try. There is an in depth online video tutorial that helped me understand what to do. This was especially important to me, since I wanted to be a part of the website construction and I had no clue about how to do it. As it turned out, I've written (including links, graphics, third columns) and built almost every page on this site. I was impressed with the hours and hours of video workshops, plus hundreds of pages of downloadable tips and strategies. I still refer back to it for information. Anyway, I started with brainstorming ideas and researching keywords. I knew I wanted to write about kids and chores, but in order to be a successful online business, I needed to know what keywords people were looking for in search engines so that we could find each other, and SBI has an easy tool to find keyword data. After registering a domain name (which SBI hosts), I started writing and building pages. I did not know a single bit of html. Not a bit! SBI has a block building template that lets anyone (and I mean anyone!) build a webpage. You can choose a text block, or a link block, or a graphics block, you get the idea. Next, SBI analyzes my content for keyword placement, and then I just build it. The emphasis is content, content, content! Once I got the ball rolling with pages, SBI helped me build an on-site blog and an E-zine. You can create forms for visitor feedback, questionnaires, voting blocks and more. Once traffic started building, SBI tracked the visitor data, similar to Google Analytics. SBI explained how to utilize social media like Facebook and Twitter to build traffic to my site. I even figured out the code to add a Facebook fan box to my blog and website. SBI also provided the search tools for looking for similar sites and blogs. There are more tools that I haven't even utilized yet, but I know that SBI is there ready to explain it to me when the time comes. My next step is monetizing. I'm happy to share the parenting ideas that have worked for our family, but my ultimate goal is to earn some passive income from this site. SBI fully explains monetizing strategies and shows you how and when to proceed. On some pages on this site, I have AdSense, which helps me earn some income when people click on an ad. Other SBIers expand an existing business with a site; it all depends on what you might want to do. I won't say this process is fast--writing content and learning the steps has taken time, just like any new business would require. 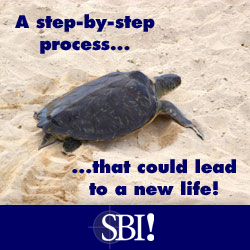 That's why the SBI logo is a cute little turtle—you know, slow and steady and all that. But I will say that it has not been difficult at all. Plus it's been fun and exciting watching this project grow.